SFV #FMIWT Launch Event at Anime Revolution. Commentary Tryouts! We will also be doing tryouts for commentators for our entire season. This is a paid position from Gouki.com and Anime Revolution. Interviews and tryouts will be available from 6-9 during the live broadcast on Gouki.TV. Street Fighter V launch. Live stream on Gouki.tv. 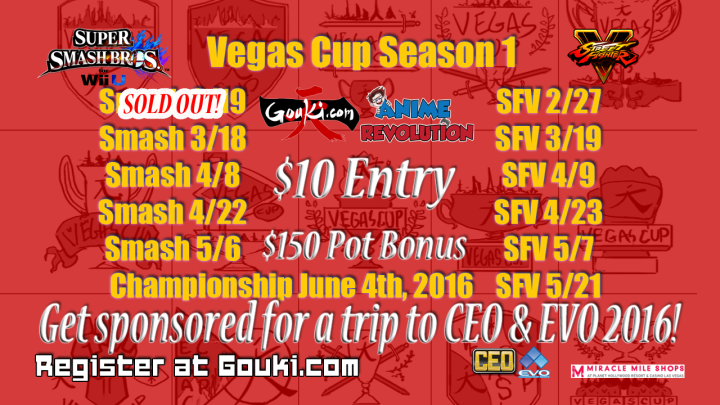 Check out the full schedule for the #VegasCup here. #FMIWT @ GameWorks Las Vegas, NV is now closed. For a lot of people we were just playing games. But for me... For Me It Was Tuesday! 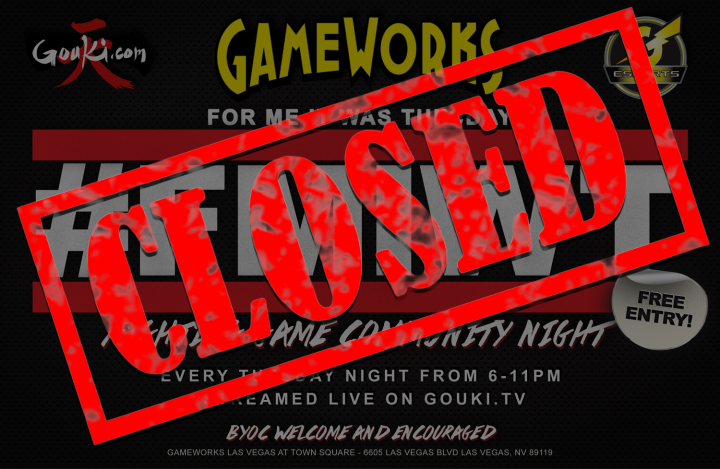 As of today Gouki.com will no longer be hosting For Me It Was Tuesday (#FMIWT) at GameWorks in Las Vegas, NV. We would like to thank everyone from the Las Vegas community who supported us in keeping our weekly gaming meetup going. Thank you to Scott, Daysha & Greg for their hospitality at GameWorks. When we started #FMIWT in 2014, it was just a few people in the back of the eSports lounge. We grew to over 100 people every Tuesday. Our very first Saturday tournament at GameWorks last year peaked at over 90 entries. Vegas Violence II had the most out-of-state players than any other tournament in Las Vegas. (Except EVO) We then moved to the front of GameWorks in the restaurant, but were quickly shuffled into the party rooms because of the pace that we were growing. We ran over 40 tournaments at GameWorks. We hosted the official EVO party in 2015. Participated & helped run multiple community events, including Hunniecon. We are leaving because we want to do larger scale events. Something we can not do at GameWorks. There is no room for us to grow at GameWorks. In the coming days we will have more announcements. We will continue to partner with Anime Revolution & we will announce another new partnership soon. Thank you to the Melee crowd that brought the largest group most of the time. Thank you to the Smash 4 community, you guys are crazy, but you are awesome. Thank you to the old school boys. We appreciate the care you take of your collections & when you brought them to #FMIWT it was an honor. Thank you Las Vegas & beyond for your support. 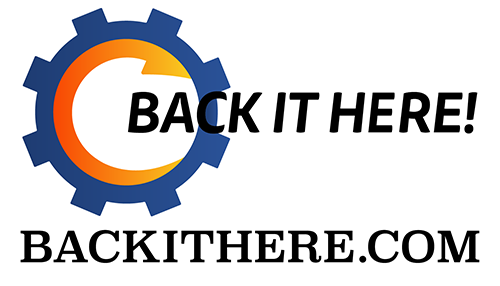 We’re moving on to better things! Stay tuned to our Twitter: twitter.com/goukinews & Gouki.com for more tournament & event information. Recorded live from GameWorks on September 1, 2015. Stream by 5th Dimension on GoukiTV.